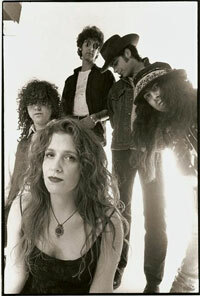 If you were a rock fan in Seattle in the early nineties you were a fan of Kim Virant and her band Lazy Susan. With their Stonesy double guitar stomp and Kim’s charismatic vocals, Lazy Susan ruled the club scene, working their way from small venues to routinely selling out 1000 person capacity rooms. Local rock radio stations KISW and KXRX played Lazy Susan’s first locally released album, “Twang,” and soon the labels were calling. Kim and Lazy Susan found themselves closing in on a deal with Hollywood Records but sadly the deal blew up and it was time for Kim to move on.
. Her next two records focused on an Alternative-Country/rootsy guitar-based sound. Through the late nineties Kim and her band played a long list of killer shows including opening for Page/Plant, Pearl Jam, and JohnDoe. In 2003, Kim decided it was time for a change and began working with local producer and recording artist Pete Droge (If you Don’t Love Me (I’ll Kill Myself )/The Thorns). Kim and Pete recorded a 4 song EP that put Kim’s voice in the center of great songs and sparse arrangements. The collaboration was a major springboard for Kim and she soon contacted producer Jon Plum (Brandi Carlile) about doing a full length record. Recorded over 3 years, mainly at London Bridge studio in Seattle, “Songs from a Small House” continued Kim’s journey from rock frontwoman to singer/songwriter. Kim continues to write and perform in Seattle and is planning another recording session in 2013.